Gravity offers comprehensive support services for marine projects. From custom sensors to our proprietary sediment coring systems Gravity has the staff, experience, and resources to successfully complete all aspects of your project. 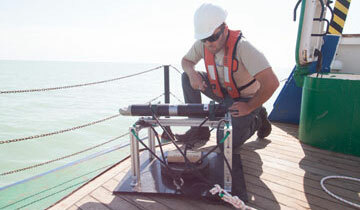 Gravity retains a fleet of custom vessels designed specifically for sampling and survey. Our vessels range up to 36′ in length and include jet boats, landing crafts, catamarans, and an airboat. We can mobilize our boats anywhere in the USA, and a few of our vessels are custom built for container shipping abroad. 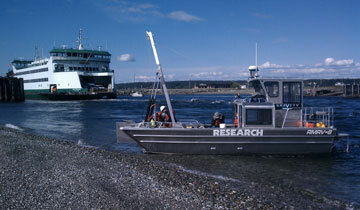 We also have numerous strategic partners that can provide us with larger research vessels for survey programs. Gravity Marine provides domestic and global logistical support to assist in a realistic approach to complex marine survey programs. The latest technologies, equipment, and experienced personnel for accomplishing principal and secondary vessel support. Analysis of topographical, tidal, and weather information at your site for planning and safety, including computerized hydrodynamic modeling necessary for complex marine systems. Expert guidance in locating vessels for charter or hire worldwide, including on/hire off/hire surveys and specialized crews. Design, construction, and vessel modification that you may require for your specific project. Over a decade of field expertise to solve any marine-related problems. Using the latest technology, Gravity owns and operates a large variety of specialized sampling and testing equipment for marine studies. From in-situ water probes to sediment coring and metocean data buoys, Gravity can collect critical information accurately and safely. Gravity utilizes highly trained and experienced personnel to assist in meeting project objectives. We are known for our progressive approach to surveys and investigations, and we pride ourselves in staying up to date with the latest survey and sampling technologies to meet any project challenges. As a Seattle-based company, Gravity benefits from direct access to many local marine builders. Custom boat builder Bean Marine Fabrication (BMF) has built more than ten custom research vessels for Gravity projects. 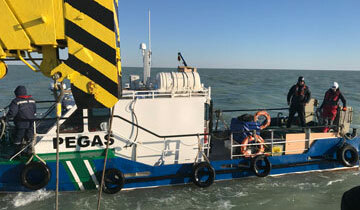 Gravity and BMF have teamed to build research vessels for local universities, oil and gas clients, and diving companies. We also work closely with a local ROV company and machine shop to make custom underwater equipment for oceanographic studies. Through local teaming Gravity has custom-built research boats that will fit in freight containers for shipping to places like Papua New Guinea. 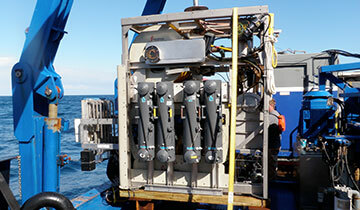 Our team has also designed robotic systems that can sample sediment at 3000 meters undersea.